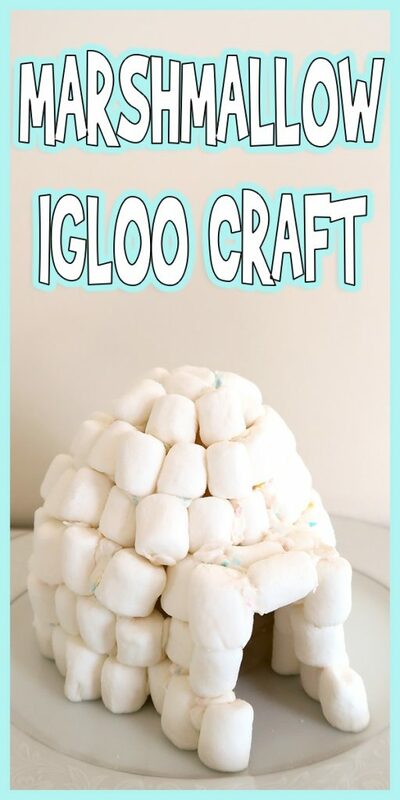 Let’s learn how to make this fun Marshmallow Igloo Craft! 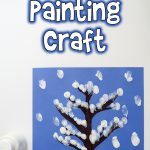 I love this for an I is for Igloo alphabet lesson craft, and it’s also great for older kids learning about different cultures or dwellings. Here’s what you’ll need. Candy melts. 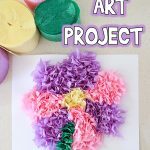 You can also use thick frosting. 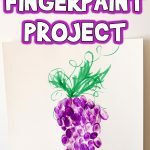 Start by cutting the bottom off of your water bottle carefully with your scissors and setting it on top of a plate or other work surface with the opening down. 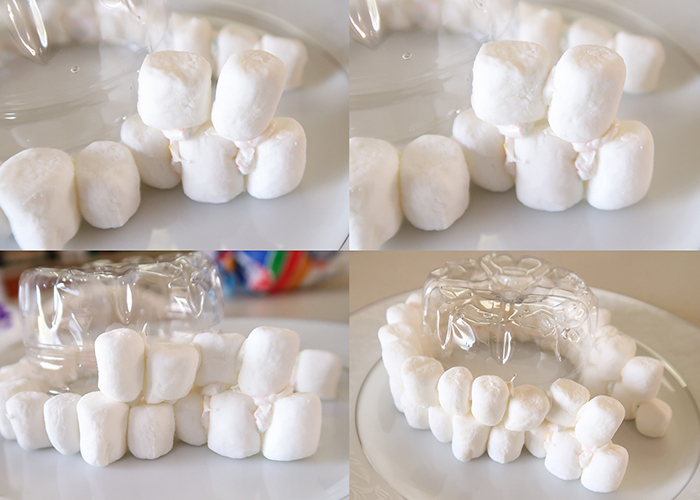 Then place some candy melts in a disposable decorating bag, and tie it shut with a rubber band. 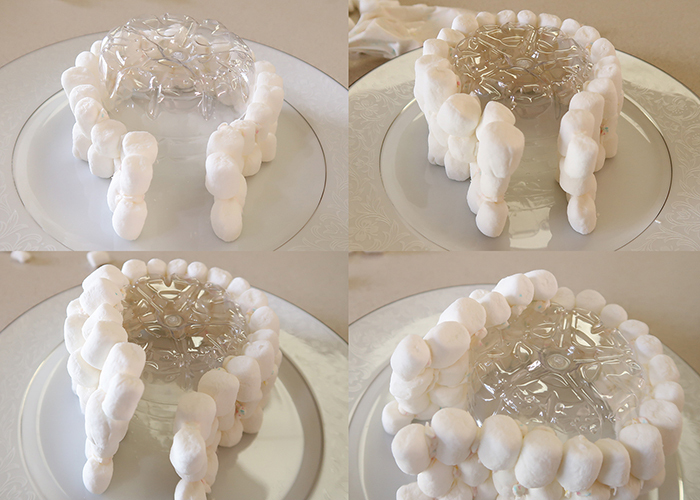 Melt the candy melts in the microwave at 15 second intervals until they’re completely melted. This should take around 45 seconds total. Snip the end off the bag. 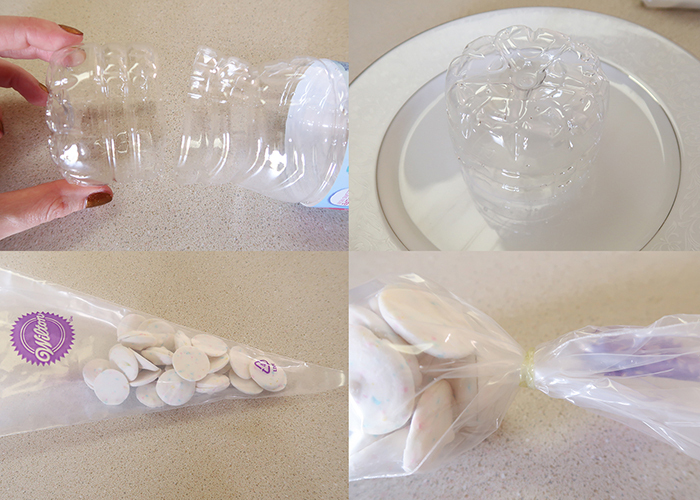 Start by placing a small dot of candy on the marshmallow, and stick it to the bottom side of the water bottle. 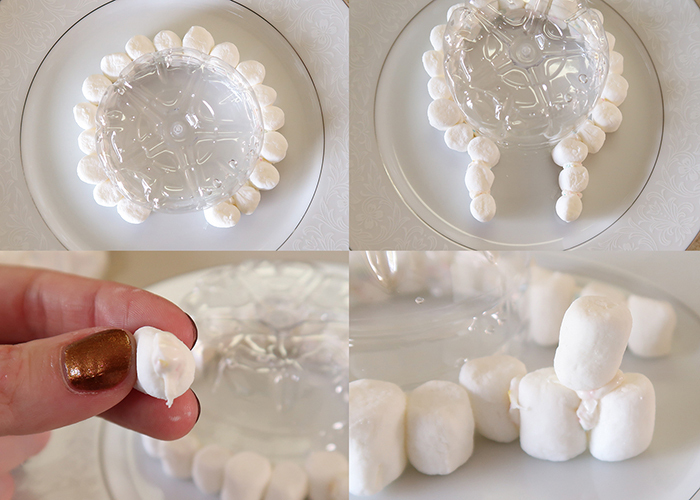 Continue around the water bottle adding marshmallows, leaving a gap at the front. 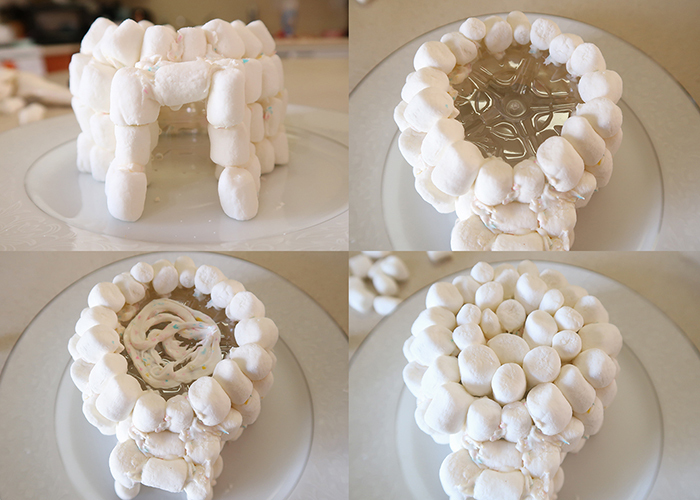 Glue on two marshmallows coming straight out like shown to form the opening for the igloo. 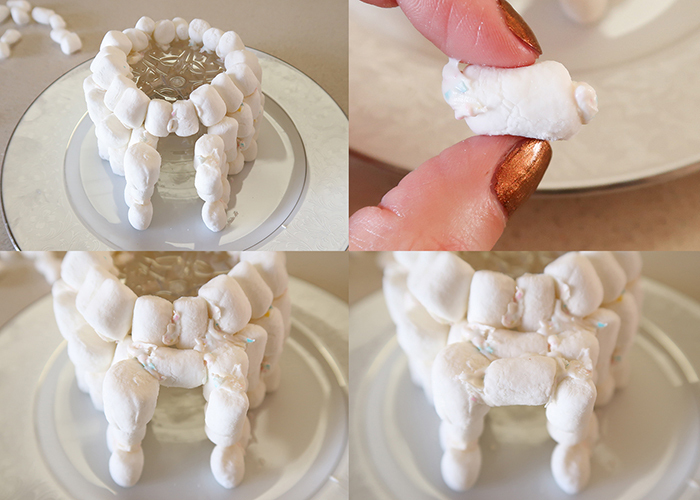 Next, place some candy on the bottom and one side of a marshmallow, and place it on top of two marshmallows, like you would stack bricks. 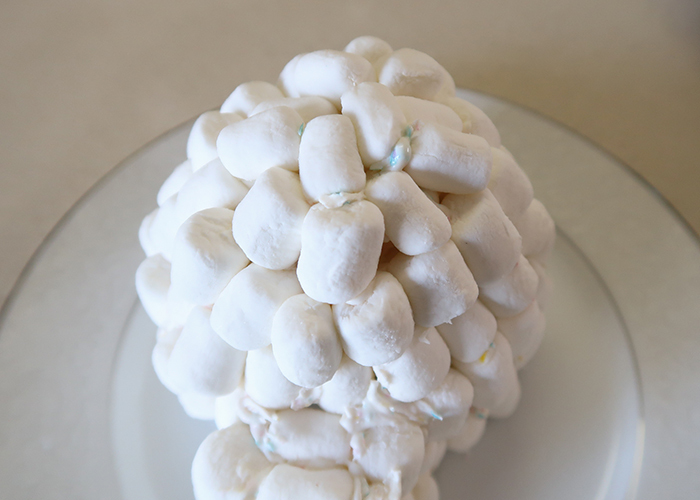 Continue stacking the marshmallows, working one row at a time. 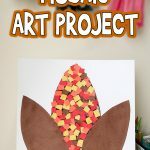 You can fill in any big gaps with a dot of the candy glue. Finish your second row, and then your third row. Your amount of rows may vary depending on the size of your water bottle. When you get to the top edge of the bottle, start angling your marshmallows inwards. At the top edge, complete the circle. You don’t want the opening of the igloo to go all the way to the top! 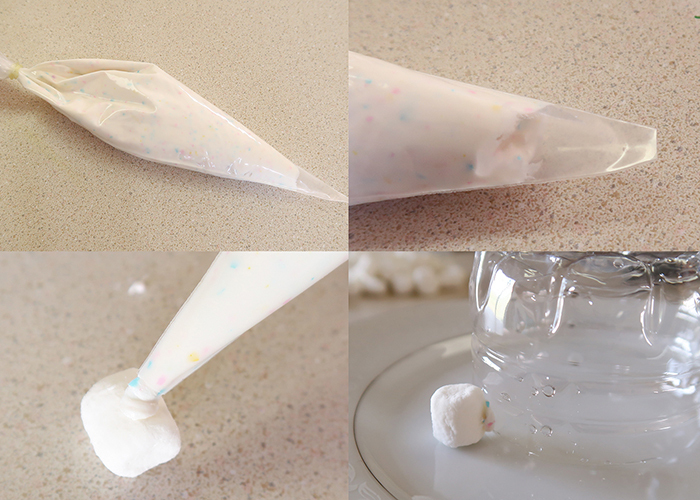 To finish off the opening, place a dot of glue on either side of a marshmallow, and place it in between two of the opening marshmallows, creating a roof. Repeat this until the roof is done, mine only took two marshmallows. 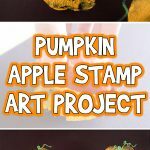 If this is confusing at all, make sure to refer to the photos! It’s actually surprisingly sturdy with all the candy holding it together. 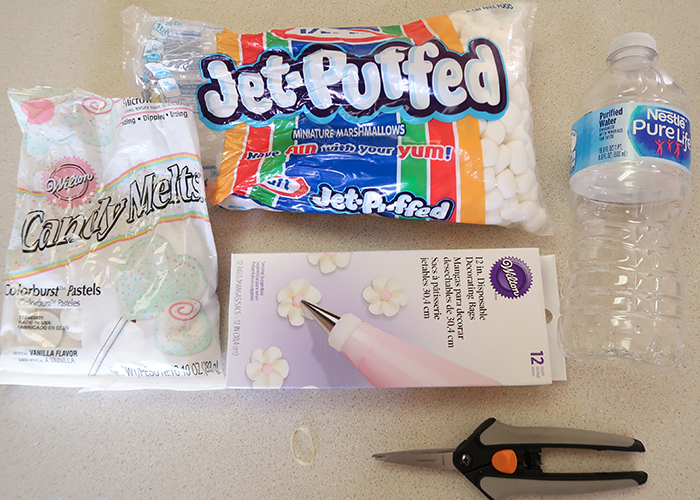 Build up around the top edge, and then spread a layer of the candy glue on the top of the water bottle. 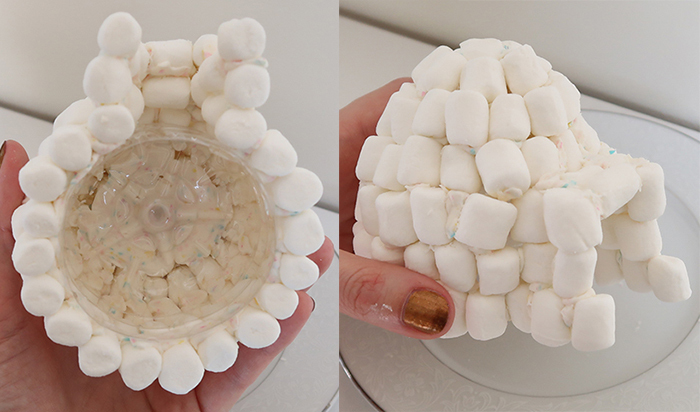 Randomly fill in the space with marshmallows to create a base for the rounded roof. 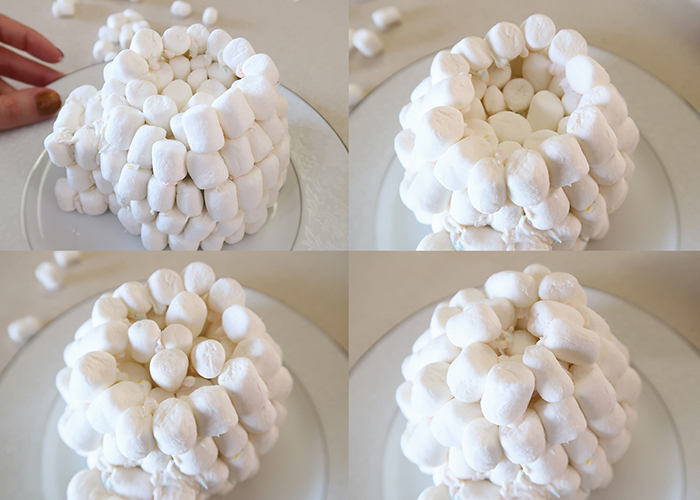 Keep building up the sides, easing the marshmallows inward and smaller as you go up. 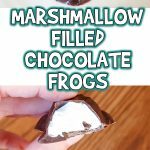 Add in extra filler marshmallows if needed. Fill in the last couple marshmallows, and you’re all done! Because it’s built around a sturdy base, the igloo can be moved around and examined. You can even put a battery operated tea light in it! 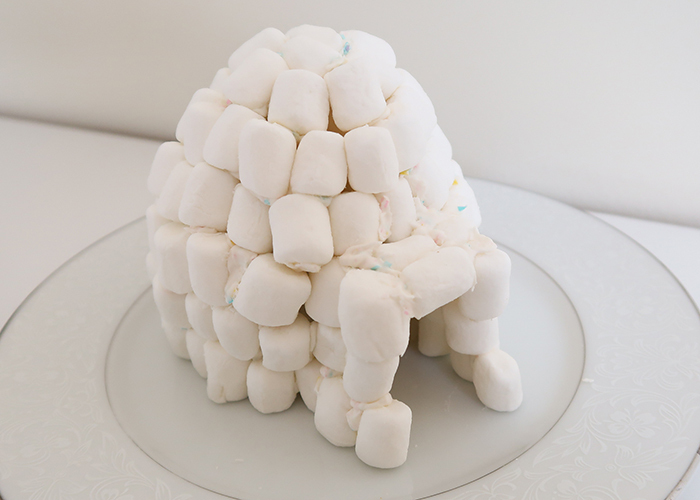 I hope you enjoyed making this Marshmallow Igloo Craft with me!